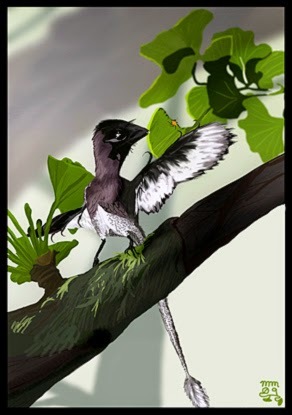 Drawing of Ginkgo branch with Scansoriopteryx heilmanni, one of the smallest dinosaurs (theropod), Upper Jurassic period (c. 150 million years ago), China. Ginkgo leaf form not correct, read my Fossils-page. 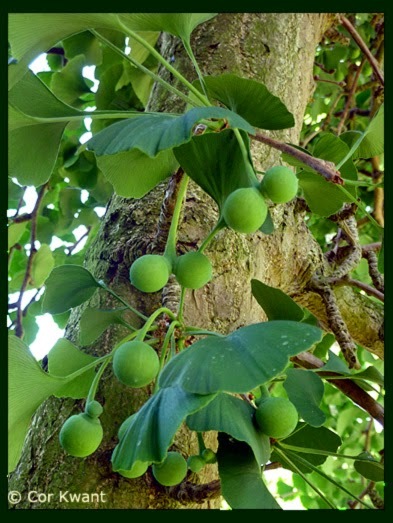 * New topic: The Ginkgo Tweets: 1500+ followers on Twitter! Thank you Ginkgo followers!!! Spectacular video on YouTube by Daeji Development Co., Ltd, Seoul, of the transplanting of a 750-year-old Ginkgo tree, Kyungbuk Ahndonggun Yonggyeri, South Korea. This Ginkgo tree is 31 m in height, girth 14 m and is one of the biggest of South Korea, National monument no.175. The transplant is listed in the Guinness World Records register in 2013. * Two new supersized photos on my Photospecial page: Ginkgo tree Hortus botanicus Leiden, 1785 + female branch. * New topic: Video of transplanting 750-year-old Yonggyeri Ginkgo tree in South Korea.